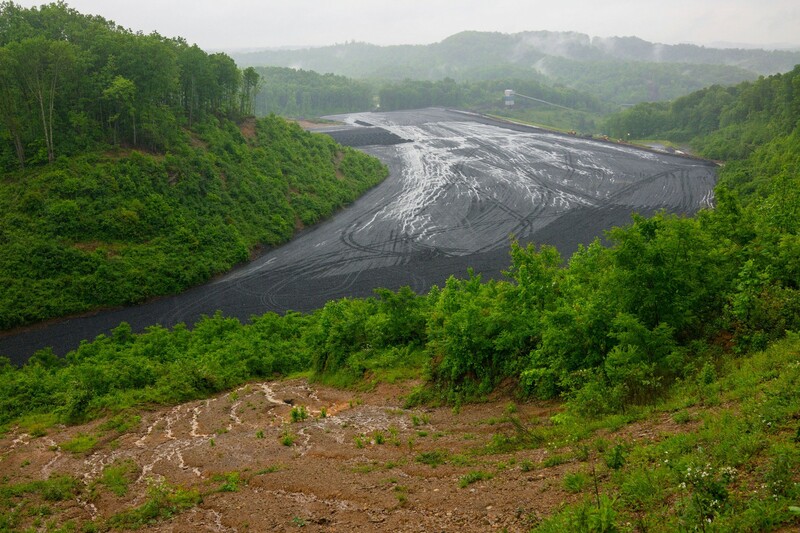 The company is facing lawsuits from devastated communities in West Virginia. One evening last fall, Martin West finally reached his breaking point. The sheriff and treasurer of McDowell County, W.Va., was watching the local news when a report about the deepening opioid crisis came on. What he learned that night incensed him. West, 62, is also a pastor in his community, and he has seen a lot of suffering. He was born and raised in McDowell County, and over his lifetime he’s borne witness to its inexorable decline. In his youth it had been a prosperous place. 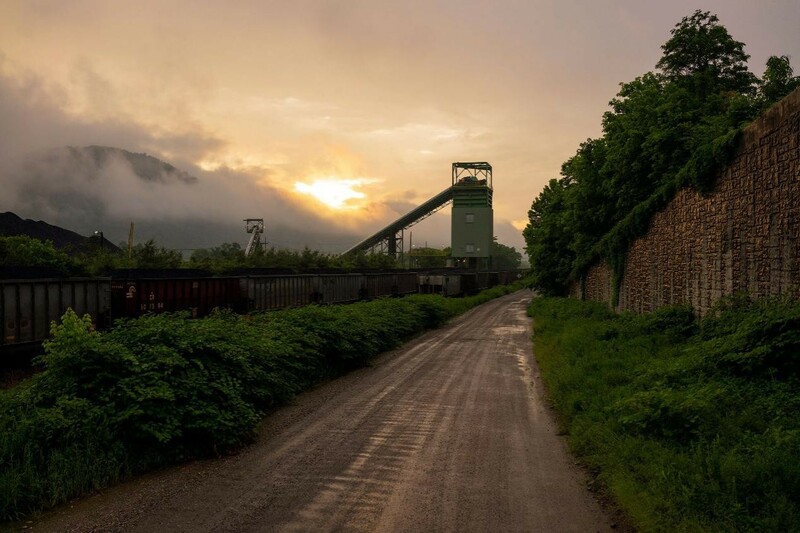 The southernmost county in West Virginia, it was at the heart of what was then the state’s booming coal country. West himself worked in the mines until 1982, when he was laid off. At 29 he was elected to be a county magistrate. And for 27 years, before he was elected sheriff, he presided over court cases—ones that increasingly involved the stories of lives undone by drugs and poverty, and of an opioid epidemic taking root. But what got him boiling mad was the news report that night highlighted War, an 800-person town in McDowell County. It explained how War had come to be flooded with far more prescription pain medicines than its population could ever reasonably or safely consume. The medication had been shipped there, West learned from the news, by a handful of extremely large, highly profitable companies that distribute prescription drugs across the country. West now had a new target for his frustration about the growing toll of opioids: the so-called wholesalers. “In my thinking, they were no different than drug dealers selling on the street,” he tells Fortune. The sheriff wanted a criminal prosecution, or failing that some compensation from those companies for the damage they’d done. In December, McDowell became the first county in the state to file a lawsuit against the “big three” drug distributors: McKesson (mck, -0.01%), No. 5 on this year’s Fortune 500, with $192 billion in revenue; AmerisourceBergen (abc, -0.38%), No. 11, with $147 billion; and Cardinal Health (cah, +0.32%), No. 15, with $122 billion. All of the companies deny the charges and say that they comply with all relevant laws and are working with authorities to prevent abuse in the system. Sheriff West took aim at the wholesalers at a moment of growing focus on the industry’s role in prescription drug distribution and outrage about what it had done in West Virginia. Damning details emerged late last year thanks to Eric Eyre, a reporter at the Charleston Gazette-Mail. In a Pulitzer Prize–­winning series, Eyre published a staggering set of data—some of which the industry fiercely fought to keep under court seal—revealing just how many opioids the industry had delivered to the state. The numbers are hard to fathom: Between 2007 and 2012, as the nation’s opioid epidemic spiraled out of control, wholesalers collectively shipped 780 million pain pills to West Virginia—or 433 doses for every man, woman, and child there. The big three alone delivered more than half of those, according to the Gazette-Mail’s analysis: some 423 million pills. Small cities were disproportionately flooded. 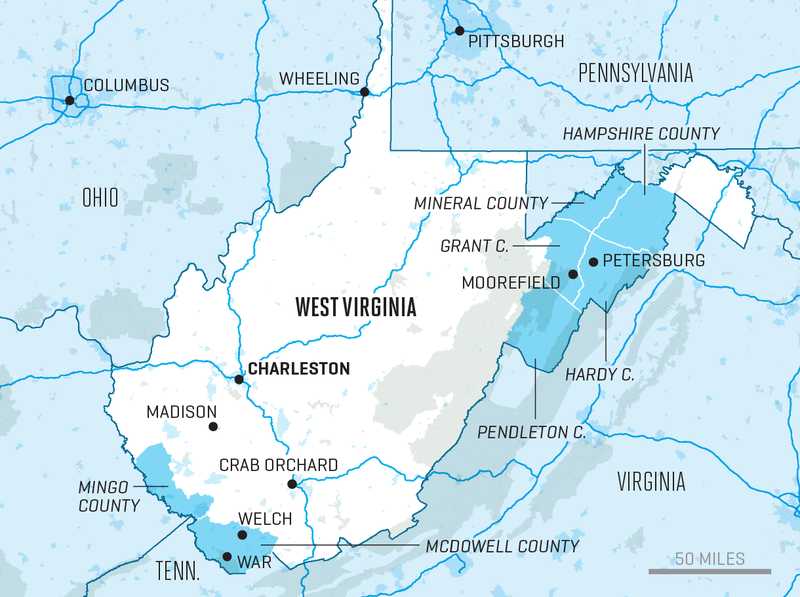 The West Virginia town of ­Gilbert (pop. 433), recently filed its own lawsuit against the distributors. In its complaint, the municipality alleged that between 2007 and 2012 it was shipped 5,331,970 doses of hydrocodone and oxycodone. 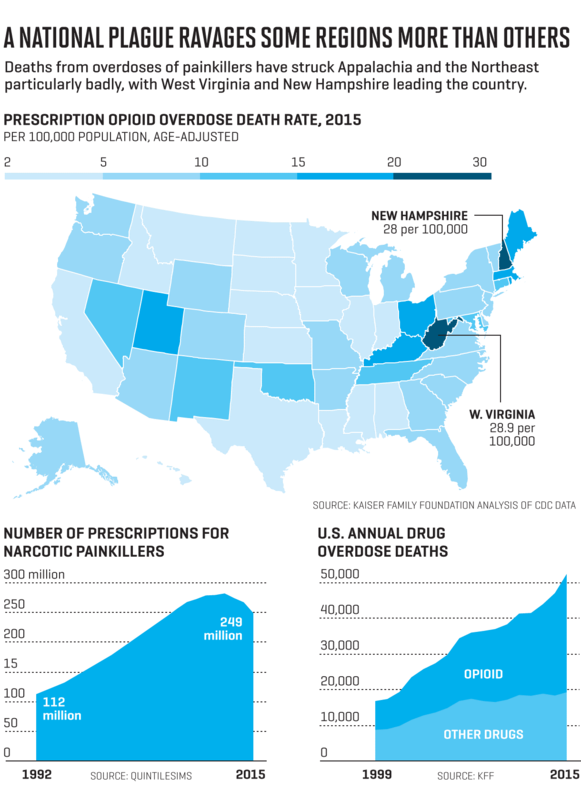 America is suffering through a full-blown opioid epidemic—and it’s hardly confined to West Virginia. It is now significantly more likely that an American will die of a drug overdose than in a car crash. In 2015 opioid overdoses claimed 91 lives a day in the U.S. Many other users hover on the edge of survival. On a typical day, more than a thousand people are treated in ERs across the country for misusing prescription opioids. Since 1999 the amount of opioids sold almost quadrupled. 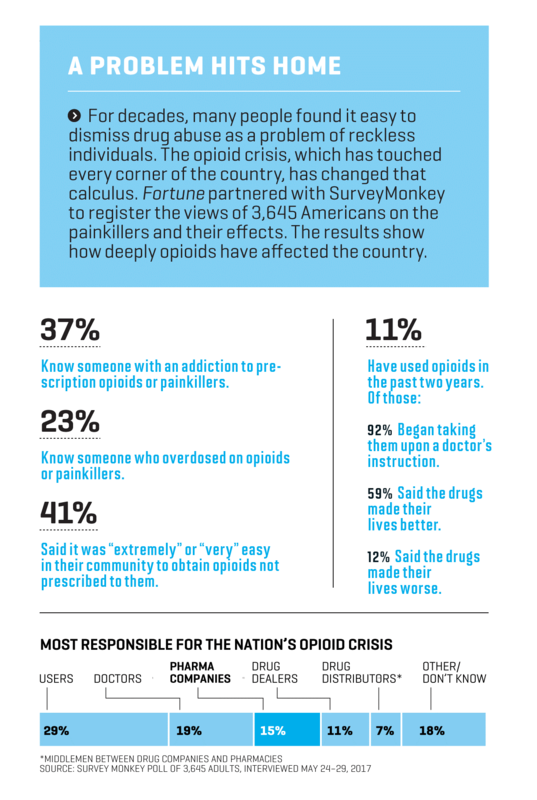 It’s estimated that some 2.5 million struggle with addiction to prescription opioids. The people who have fallen under the sway of addiction have been blamed or sympathized with over the years. The doctors who casually prescribe the meds have been criticized. The companies that make the opioids, such as Purdue Pharma (the seller of OxyContin) have been lacerated. Now the distributors are being called to account. That applies perhaps most of all to the giant of the industry: McKesson. On top of the suit by McDowell County, McKesson is now facing a lawsuit brought in 2016 by West Virginia Attorney General Patrick Morrisey. That suit alleges that the distributor failed to identify, report, and stop the shipment of suspicious orders of opioids in the state from 2007 to the present in violation of West Virginia’s controlled substances act. McKesson is fighting the charges in court. The settlements and pill-dumping allegations have put the previously low-profile wholesaling industry in the hot seat just as public and political outrage over the opioid epidemic reaches a fever pitch. But it’s hardly the first time questions over the role of distributors in the pharmaceutical supply chain have been raised. Indeed, the industry has sparred with the DEA for much of the past decade about the role it should play in monitoring the delivery of drugs. In truth, the opioid crisis is a story of colossal, collective failure—an epidemic that no one fully understood until it was too late. The medical establishment didn’t grasp—in some cases, didn’t want to grasp—the destructive potential of the drugs it was giving out to manage pain until they began to wreak havoc. Pharmacists were not as curious as they should have been about doctors doling out prescriptions or patients filling them. Despite warning signs, the DEA consistently raised the national quotas for prescription opioids until 2013. Some argue that when the agency did choke the supply, the epidemic simply got worse, as addicts turned to heroin. But it’s also true that the drug distributors, including McKesson, played a role in the proliferation of pain pills across America. To better understand how that came to be—and the impact of the company’s behavior on some of the country’s hardest-hit communities—­Fortune delved deeply into McKesson’s history with opioids. 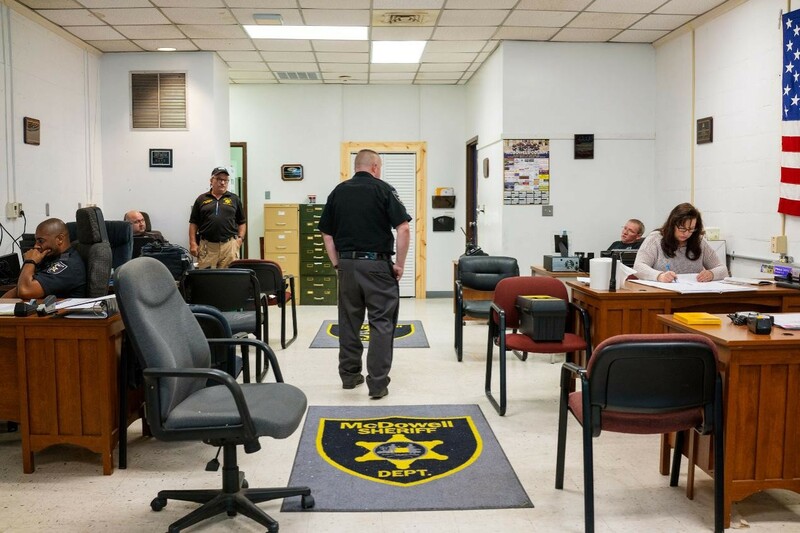 We interviewed drug enforcement officials, industry executives, prosecutors, and average West Virginians battling the crisis on the front lines. One thing is clear: It certainly wasn’t all McKesson’s fault. But you can’t have a drug epidemic without a distributor. The slogan serves to humanize the never-ending process of moving pills across America. Seven days a week the company’s 68,000 employees work to efficiently distribute millions of essential medications. Those drugs run the gamut from temperature-sensitive chemotherapy agents to aspirin. Most of the action actually happens at night, when the company’s 28 DCs really come alive. 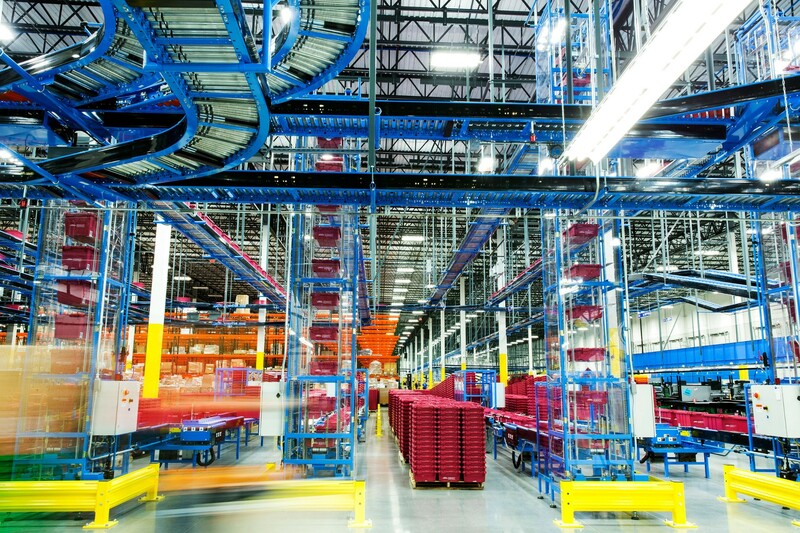 During those hours, the floor looks like a miniature amusement park, with red and blue tote bins zipping along an elaborate, multilevel conveyor track. Workers report at 7 p.m. to begin fulfilling the day’s orders, picking medications and depositing them into the corresponding tote. The process is optimized for efficiency: ­McKesson has planned and timed every human motion required in the picking process. There are some drugs only certain people can pick. Those include controlled substances, which are locked, monitored, and stored in DEA-regulated spaces. The most addictive drugs, like prescription opioids, are held in a so-called vault and packaged in specially sealed plastic bags by background-checked workers under the gaze of several cameras. Most of McKesson’s DCs serve thousands of pharmacies. The company’s unmarked delivery trucks begin rolling out at midnight to ensure the medications make it to their destination by morning. The company has a 99.996% accurate fill rate, meaning its customers almost always get exactly what they order. Its low profile suits the company just fine, but it does mask the corporation’s long and rather extraordinary history. McKesson was founded 184 years ago in New York as a small Manhattan shop supplying drugs to ships docked in the harbor. A couple of decades later, its sales territory ranged across 17 states, which McKesson served via covered wagon. The company soon started making drugs, tonics, and tinctures, and it became better known as a manufacturer. For a time, during Prohibition, it was owned by a bootlegger. Later it distributed everything from alcohol to pasta to WD-40 before turning its focus exclusively on health care. After an accounting scandal in the late 1990s, Hammergren, a then 40-year-old of modest upbringing from small-town Minnesota, was named co-CEO. He took sole possession of the job in 2001. And under his leadership the company has been one of the biggest beneficiaries of the vastly expanding health care economy. 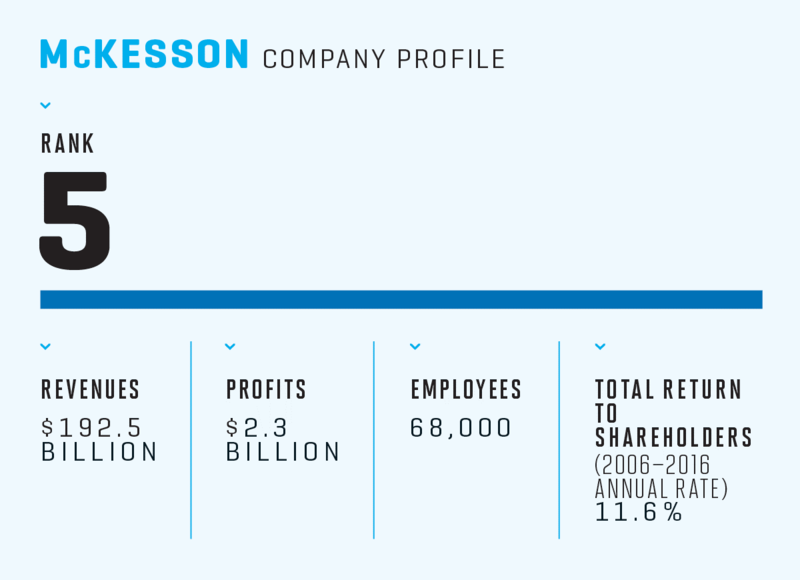 During his tenure, McKesson has grown from a $30 billion business, ranking No. 38 on the Fortune 500, to a nearly $200 billion operation. He has done so in part by insinuating McKesson, once just a supply-chain functionary, more deeply into the business of its customers. McKesson now manages cancer clinics, consults for hospital pharmacies, and makes technology used in managing pharmacies. Hammergren has been rewarded handsomely for this success—some might say obscenely. He has consistently been one of America’s highest-paid executives. Over the past 10 years, according to company filings, Hammergren has taken home $639 million in total compensation. The skyrocketing price of pharmaceuticals has lifted the fortunes of the wholesalers in recent years. But the distribution business is incredibly competitive. And that’s particularly true when it comes to winning the business of independent pharmacies. These are the mom-and-pop stores off which the industry tends to make the highest margins—and which have featured prominently in the narrative of West Virginia’s opioid epidemic. Raj Masih is doing what he does every Thursday morning: talking opioids on the radio. It’s just after 9:30 a.m., and he’s in the studio at WELD 960, an AM talk radio station in a barely there town called Fisher. It’s about a 20-minute drive from Masih’s home in Petersburg, another speck on the map in the Potomac Highlands region of West Virginia. This rural, eight-county area in the mountains of the state’s eastern panhandle is the sort of place where everyone knows your name—especially if you’re Raj Masih. 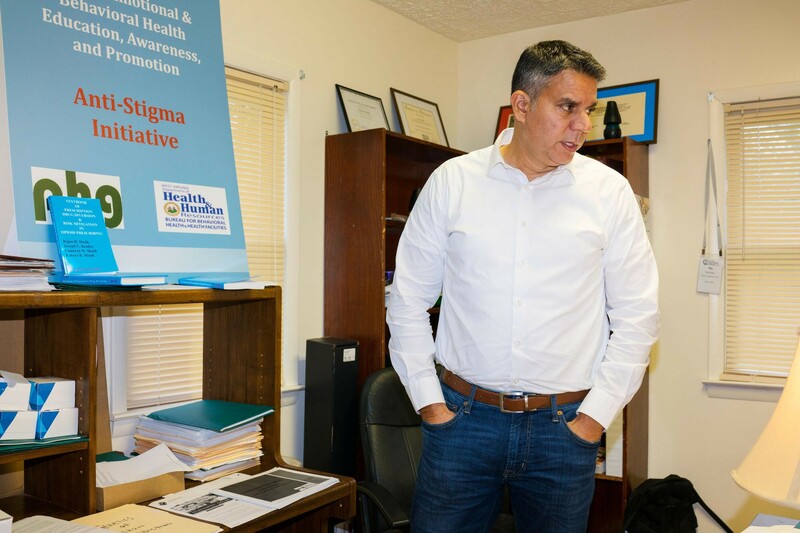 These days, as the director of the Potomac Highlands Guild’s anti-stigma program, Masih (pronounced “Ma-SEE”) clocks a lot of miles, leading trainings and speaking at town halls about addiction. 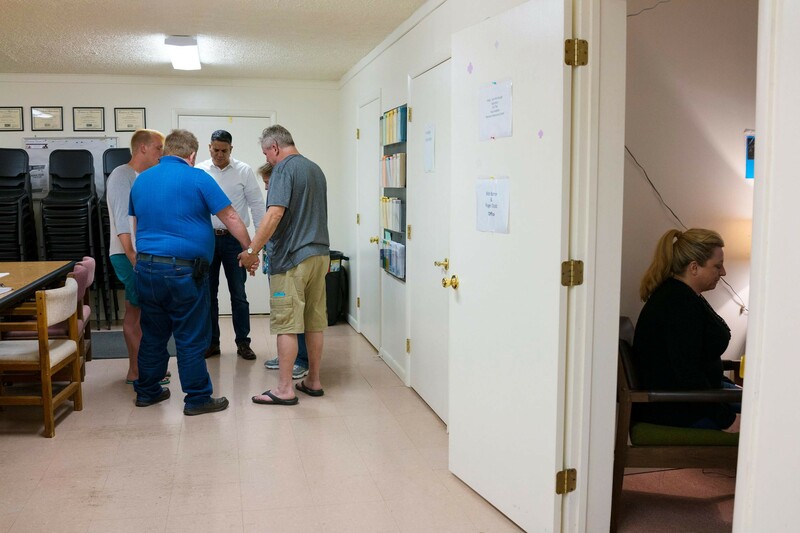 He recently opened the area’s first substance abuse clinic in Petersburg, where he runs dozens of meetings per month. He periodically briefs state politicians on his work, and this year he got a federal grant to study prescription drug monitoring programs. But before all that, Masih, 53, was the local doctor who got hooked on pain pills and, in 2010, went to prison for prescribing too many opioids. His case led to others, including the federal investigation of the Petersburg, W.Va., pharmacy that filled his many prescriptions—and ultimately of the distributor that supplied the pharmacy: McKesson. Today’s subject is naloxone. Also known by the brand name Narcan, it is a medication used as an antidote for opioid overdoses. An analysis in February by the West Virginia Health Statistics Center found that at least 818 people had died of drug overdoses in 2016 in the state. That was 13% more than in 2015, when West Virginia’s overdose death rate led the nation, with 41.5 cases per 100,000 people, according to the Centers for Disease Control and Prevention. (The next highest rate was in New Hampshire, with 34.3, followed by Kentucky with 29.3.) 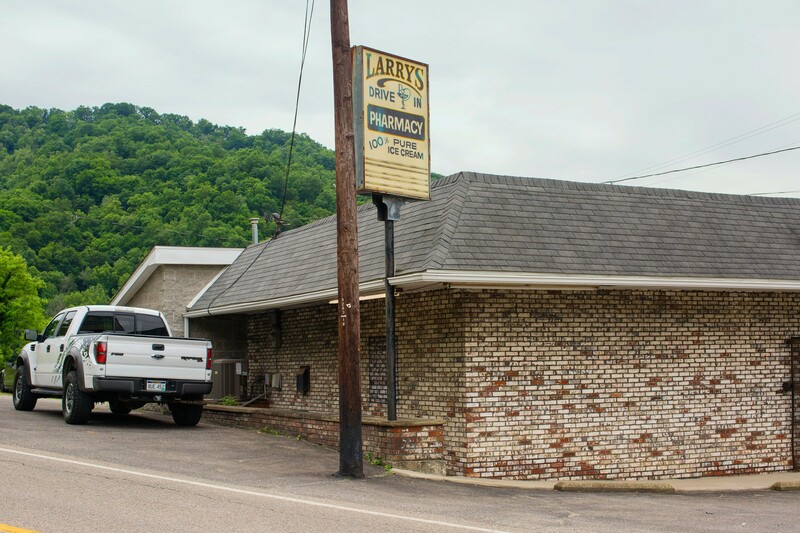 In response to the crisis, last year the West Virginia legislature mandated that all pharmacies in the state carry naloxone and dispense it to certified users, but many pharmacies were refusing to do so. The host of the show, Steve Davis, wonders aloud whether naloxone enabled addicts, by reducing the threat of fatally overdosing, and he concedes that he’s sympathetic to pharmacists who don’t want to carry it for fear of being blamed later. Masih didn’t know what to expect when he moved his family from Texas to this corner of West Virginia in 2000. He relocated there to run the emergency room in a local hospital, a small brick building that shares a hill with a Civil War memorial site. The son of an Indian surgeon and a British homemaker, Masih stuck out in Petersburg, a town of 2,500. He had a taste for flashy cars—his fleet included a Porsche, a Hummer, and a Mustang convertible—and thrill-seeking hobbies like IndyCar racing and hunting with an AK-47. But even if he was something apart, Petersburg suited Masih. He convinced his brother Ravi to move there as well. He coached youth soccer. He earned a reputation as a good and caring doctor. In 2007, the Masih brothers opened an urgent care clinic atop a tanning salon in neighboring Moorefield. It was strategically close to the area’s major employers—a Pilgrim’s Pride turkey plant, an American Woodmark factory—and it was outfitted with all the trappings of an ER, from surgical suction pumps to a trauma bay. There was even a helipad out back. There was just one problem with this American dream. Masih was addicted to hydrocodone, the powerful opioid in pain medicines like Vicodin and Lortab. His addiction began in 2004, when he hurt his back in an IndyCar wreck. When he couldn’t find someone to cover his ER shift the next day, he turned to the hospital’s supply room and took a sample of the drug. He felt amazing on it—not only unburdened of his physical pain, but also of the fatigue and burnout he typically felt on the job. “Everything evaporated,” he says. He kept taking the samples, only in higher doses and more frequently, and while he knew he was on a slippery slope, he told himself he was in control. He vowed each day that he’d quit the next. But then, inevitably, he found a reason to take the drugs again. When he did manage to “quit,” he experienced the horrible and debilitating sensations of withdrawal within a few hours. He quickly ran through the hospital’s samples and began writing prescriptions for his friends and family members—all of which he’d get filled himself at the area’s various pharmacies. It all caught up with him in August 2009, when a SWAT team burst into Masih Medical and handcuffed him to a chair while they searched his files. He was hauled to jail where in a few days’ time he says he contemplated suicide, found God, and resolved to get clean. By the time he pleaded guilty to one count of misprescribing a controlled substance, he felt free. He was sentenced to 48 months in prison. Masih might have been ready to start over, but the U.S. Attorney’s Office in the Northern District of West Virginia hadn’t quite let go of his case. They thought it might lead to something bigger. The office, which is based in Wheeling, a sleepy and picturesque town just south of the Ohio border, had for years been aggressive in going after the bad actors involved in the region’s opioid crisis. But it seemed to make little difference. The epidemic raged on. 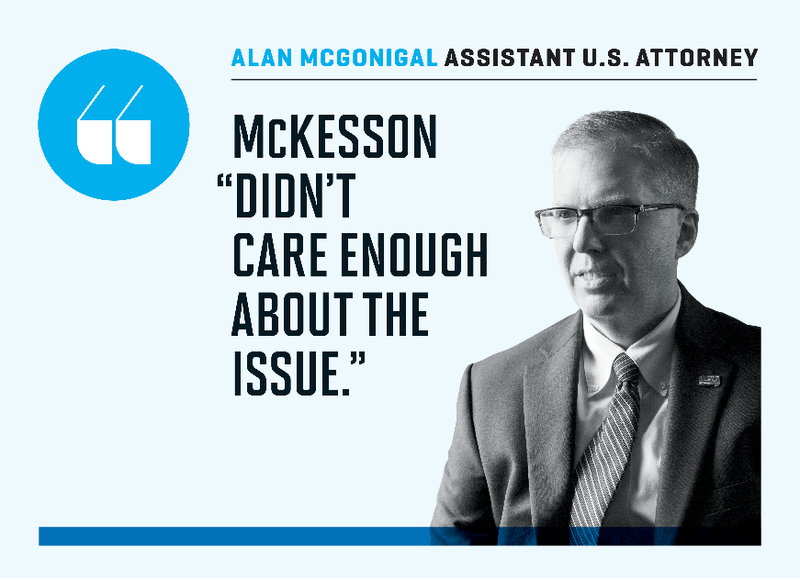 To Alan McGonigal, an Assistant U.S. Attorney in the district’s civil division, the rampant abuse of prescription drugs required a more holistic strategy, one that he had often used in prosecuting health care fraud: Find the gatekeepers. Someone had been filling Masih’s many illegitimate scripts, and some company had been sending more and more drugs to rural West Virginia. “We had to stop the flow,” he says. That strategy wasn’t unique to Wheeling. The DEA had begun contemplating how it regulated the broader pharmaceutical supply chain back in the mid-2000s as the online pharmacies flourished and the opioid epidemic took root. The DEA viewed distributors—the nation’s pharmaceutical fire hose—as key to its efforts to stop criminal misuse of pain pills. By law, in fact, it’s something distributors are required to help prevent. That law is the decades-old Controlled Substances Act, which requires wholesalers like McKesson to maintain a system to detect and prevent “diversion,” or the nonsanctioned use of prescription drugs. Distributors are required to report any “suspicious orders”—those of unusual size, frequency, or deviating from normal patterns—to the DEA. But until 2005, these rules had never really been enforced. Distributors generally didn’t identify suspicious orders and the DEA didn’t investigate them, says Larry Cote, a former lawyer for the agency who now represents the industry at the firm Brady & Quarles. Instead, wholesalers were in the habit of submitting monthly “Excessive Purchase Reports”—thick files that sometimes included every order a wholesaler had processed during the period. With prescription drug abuse spreading, the agency attempted a reset. In the fall of 2005, the DEA’s Office of Diversion Control launched its “Distributor Initiative,” an effort to engage with wholesalers over their legal responsibilities and the severity of the country’s diversion problem. Then, in 2006 and 2007, the DEA sent three separate letters reminding distributors of their obligations. Noting that the country faced epidemic levels of prescription drug abuse, the letters also contained more explicit expectations that registrants “know their customers”—i.e., engage in due diligence to ensure pharmacies and dispensers were aboveboard—and that they report and refrain from shipping suspicious orders. This new guidance was not well received by the distributors. As the industry saw it, this sort of investigative work fell beyond their purview: They were in the business of moving FDA-approved drugs that had been prescribed by licensed physicians to DEA-registered pharmacies. Tasking them with determining whether or not a particular customer or order was legitimate was, in their view, asking them to meddle in medical decision-making. Plus, distributors don’t have full visibility of a pharmacy’s orders of controlled substances; they only know what they deliver. There were plenty of other complaints that the DEA’s guidance was unclear or too vague—claims that proved to have some merit. In 2016, DEA administrator Chuck Rosenberg conceded the agency had been “opaque” in dealing with the wholesalers. By the time Masih was in prison, the DEA had begun aggressively ramping up enforcement. And by the agency’s book, Masih’s criminal overprescribing hadn’t happened in a vacuum. He’d been aided and abetted, as they saw it, by the pharmaceutical supply chain. More specifically, his accomplices had been a third-generation mom-and-pop outlet on Main Street in Petersburg called Judy’s Drug Store—as well as the pharmacy’s primary supplier, McKesson. That was the argument that criminal prosecutors and DEA agents made to McGonigal in May 2012. McGonigal agreed to look into it. The Petersburg area has a few pharmacies to choose from. But most of Masih’s pain patients went to Judy’s, where he also stopped some mornings to pick up medical supplies. The relationship seemed suspicious to McGonigal (as did the fact that Judy’s had recently opened a second outlet in Moorefield close to Masih’s clinic). The prosecutor was convinced that something wasn’t right about the small-town pharmacy. In December 2014, Judy’s reached a $2 million civil settlement with the Justice Department for claims of improper dispensing. The pharmacy, which did not admit to any wrongdoing, also agreed to a stricter reporting arrangement, under which it still operates. 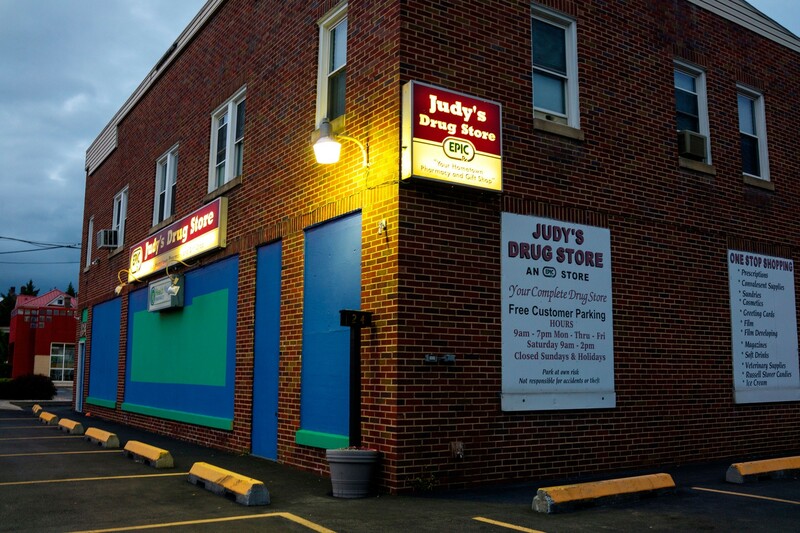 A lawyer for Judy’s says the store’s pharmacists believed they were filling legitimate prescriptions, and points out that no DEA enforcement action was ever taken against the pharmacists. The original Judy’s remains in business today, operating as it has since 1965, out of a brick building in the heart of Petersburg. (Its Moorefield location has closed.) On a recent Friday afternoon when I stopped in, an elderly woman stood ready at the cash register in front of a row of neatly hung plastic bags, all filled with prescription medications ready for pickup. Having dealt with Judy’s, the next target for McGonigal and his team was the McKesson distribution center, three hours away in Landover, Md., which delivered the bulk of the pharmacy’s drugs. The 2008 settlement agreement also dictated that McKesson develop an effective system to ensure it didn’t do so in the future. So that year the company launched its Controlled Substance Monitoring Program (CSMP). Under this three-tier system, each of McKesson’s pharmacy customers were assigned monthly threshold levels for their controlled substance orders. Orders at the threshold would block the order and trigger a review process. If the reason for reaching the threshold level was compelling, McKesson would supply the drugs and in some cases raise the threshold; if not, the matter would be passed to a regional compliance officer. If that officer deemed it suspicious, the order would be kicked up to McKesson’s corporate compliance team. If they also judged it suspicious, the company would then report the order to the DEA. When Malocu examined the DEA’s records for the Landover DC, however, it was clear to her that McKesson’s compliance system had fallen down on the job. In July 2011, she requested customer files for 20 or so suspect pharmacies that had landed on her radar. That winter, McKesson apparently realized there was a problem; in a short period of time, the Landover distribution center filed 318 suspicious orders with the DEA that covered the previous months and weeks. The government considered that number to be relatively few for a distribution center of that size and the untimely filing to be something like an admission of guilt. Both the Landover and Aurora facilities had shipped lots of controlled substances. Neither had done much to determine whether the orders were “suspicious,” according to the government, or to call the DEA’s attention to them when they were. The compliance files were especially revealing. They showed the company’s casual approach to administering its compliance program. When pharmacies hit thresholds, they typically breezed through the review process. Customers offered vague, flimsy reasons for needing more oxycodone supply—“increase in foot traffic”; “more business”—and they’d get it. The investigations of McKesson were multiplying. By the summer of 2014, prosecutors in 12 districts around the country were looking into possible violations of the Controlled Substances Act at McKesson distribution centers. In the aftermath, McKesson has once again overhauled its monitoring programs. And by all accounts the company is redoubling its efforts on compliance. Leading the effort has been Gary Boggs, who spent four decades as a DEA agent before joining McKesson in 2013 as the senior director of regulatory affairs, in the midst of the government’s investigations into McKesson. There are now some 40 individuals dedicated to McKesson’s controlled substance monitoring program, and many of them, like Boggs, came from an enforcement background. The company has made significant investments in technology, such as more sophisticated analytics systems to identify suspicious orders. Under Boggs’ leadership, it has started doing deeper, more rigorous due diligence—a change that can be traced through a trail of lawsuits involving McKesson customers who suddenly had their controlled substances cut off in 2013 and 2014. In 2015, Hammergren decided that it was time for McKesson to wade into broader policy conversations about the opioid epidemic. While some may see McKesson as part of the problem, Hammergren believes that his company, given its position in the health care system, might have insights to help with the solution. So last year he formed a task force of several dozen employees, and developed a white paper that McKesson is now circulating in Washington. The document offers six recommendations. Among them: the development of a National Patient Safety System, a data-driven, real-time tool to help pharmacists and physicians to identify patients most at risk of misusing medications. Odd as it may seem, Masih thrived in prison. At the medium-high security facility in Glenville, W.Va., he quickly became known as “Doc,” and his fellow inmates regaled him with stories of how they’d once scammed physicians into prescribing them oxycodone and other narcotics. Masih was blown away by the variety and ingenuity of their methods, and he obtained permission from the Federal Bureau of Prisons to write a textbook on how drug diversion happens. (His son, who sent him research, and his cell mate, a onetime heroin dealer, both earned author credits.) By the time Masih was released in 2014—early, for good behavior—the team had written a second manual on how prisoners abuse drugs in prison. When he’s not doing his addiction work, Masih devotes time to a company he started with his friend Wade Rohrbaugh to develop a product he calls “Raptor.” The system, which involves biometrics, electronic health records, and video-recording eyeglasses, is designed to help physicians prevent prescription drug diversion. Right now he’s shopping Raptor to medical boards. Masih thanks his brush with the law for saving his life—in more ways than one. Not only did he kick opioids, but he was also able to manage a personal health crisis that might have killed him if he’d been using. Last year, Masih learned he had a life-threatening aneurysm. (His father had suffered a ruptured aneurysm and was disabled for the rest of his life.) Masih’s primary symptom was terrible headaches, which he says he never felt when he was on pain meds. In July 2015, he was one of the first patients to undergo a radical, not-yet-FDA-approved, minimally invasive surgical procedure at the West Virginia University hospital with a device called a WEB Aneurysm Embolization System. Back in McDowell County, Sheriff West is waiting for some good news. Since the county filed suit against the distributors, a number of counties and towns in West Virginia—and a few entities beyond, such as the Cherokee Nation, in Oklahoma—have followed with their own lawsuits. The big three are fighting those, too, and dispute the merits of the claims. Questions are also being asked about the practices of McKesson and its peers by Congress, where the dire public health crisis is increasingly top of mind. In May, the House Energy and Commerce Committee launched an investigation into the wholesaler industry’s “pill dumping” practices in West Virginia. The big three each received letters of inquiry, which they were required to answer by June 8. A version of this article appears in the June 15, 2017 issue of Fortune.